Is The Surface Pro 3 The Right Device For You? I’ve owned a 64GB Surface RT from April 2013 to December 2013 and upgraded to the 1st Gen Surface Pro 128GB in November 2013. The surface devices (especially the Pro) changed my computing habits and increased productivity. However, both devices are not without faults and deficiencies. This article will discuss how the new Surface Pro 3 addresses most of my frustrations with the Surface line. Launched in June 2012, the Surface tablet was in part an answer to the overwhelming strength of the iPad in the market and a response to the lackluster high end PC solutions from Microsoft’s Partners. Microsoft realized that they need a device that could show off the best features of their new touch based OS (Windows 8) and provide a “best-in-class” example for their OEM partners to follow. Microsoft learned their hard lessons and improved the 2nd Generation of both devices launching in late September 2013. The Surface 2 slimmed down, got a bump in processor, gained an LTE enabled version, a HD screen and improved cameras. The Surface Pro 2 got the all-important important Haswell processor greatly improving battery life. Both devices received an improved 2-position kickstand. The Surface Pro has grown in size yet is significantly lighter than its predecessors. The screen size and resolution have been increased from 10.6” to 12” and 1920×1080 to 2150×1440. The aspect ratio has changed from 16:9 to 3:2. Weighing only 800g and only 9.1 mm thin, the SP3 is much better balanced in either landscape or portrait mode. To put the thinness in perspective, consider this: The SP3 is just one millimeter thicker than a Galaxy S5! The larger screen and improved resolution means that its productivity real estate has been increased. In the SP1/2, running large spreadsheets or even programming in Visual Studio meant keeping the desktop scaling at 100% to maximize the content on the screen but also straining your eyes to adjust to the small 10.6” screen. The aspect ratio also solves the ungainly balance of holding the 16:9 SP1/2 in portrait board (akin to reading from a Java house menu). The page like 3:2 aspect ratio is more suited to reading and note taking. The Kickstand and magnetic Type are two of the most unique features of the Surface, (and my favorite). It allows the Surface to be propped up easily on flat surface (pun intended), and with the keyboard magnetically attached, provide as close to a laptop experience this side of the tablet. Unfortunately the SP1 kickstand only had one position. The SP2 improved to 2. The touch pad on the both gen 1 and gen 2 Type covers, is horrible, requiring one to carry a portable mouse for serious desktop work. The SP3 has taken the Type cover and kickstand to new heights. The kickstand is now adjustable to from 22 degrees all the way up to 150 degrees), making it easier to use it a sketching platform. The SP3 Type Cover is now larger, backlit and has a thoroughly improved touchpad. This means I would have carry one less device (the mouse). To improve stability, the kickstand also magnetically attaches to front of the display to improve stability when perched on your lap. Windows 8 and the original Surface were a response to touch interface revolution spurred on by the iPad (primarily a content consumption device). However, as sales have shown and time have shown, touch is not necessarily the most productive user interface for content creation. Microsoft reacted by improving the keyboard and mouse interface with 8.1, but is still working towards the future: enabling Pen input throughout the Windows OS. The Pen is a natural productivity tool that is useful for a broad range of tasks. The inconsistency in the integration of digital ink in Windows is illustrated well by the SP1 and SP2. The pen works in different ways from application to application, immediately nullifying its usefulness. The SP3 is the first device that brings that harness the digital ink hardware and software into a productivity bonus. You can launch OneNote by just clicking the pen. The weight, accuracy and latency of the N-Trig Pen has been improved to the point where it feels and reacts just like a real pen. The fact that Adobe will release a SP3 optimized version of Photoshop CC is proof of this coming change. I am positive that Office Gemini (the touch version of Office) will support digital ink in the same way that One Note does. If executed right, this will be a huge shift in productivity. The SP3 maintains the same ports as the SP2: A mini display port, one USB 3.0 full size port, a micro SD card (expandable to 128GB), headphone combo 3.5 mm jack and an improved magnetic power jack. The two main changes are the camera upgrade (5MP rear and front), and front facing speakers. Unlike the SP1 and SP2, the Pro is now available in which only launched with Core i5 processors, the SP3 now has entry level Core i3 all the way up to Corei7. This results in a prices range as follows. 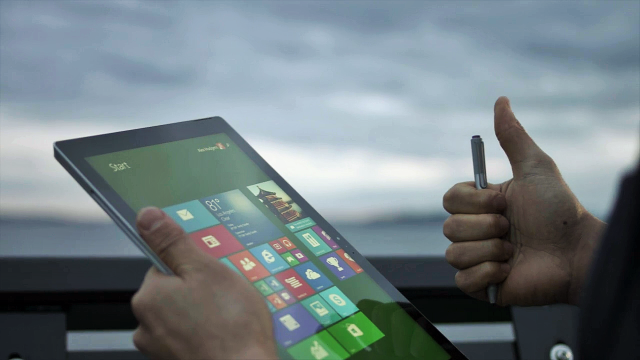 NOTE: The SP3 is a premium device aimed to set the standard of Windows ecosystem. The ideas put brought about by the surface will trickle down to more affordable devices over time. Is The Surface Pro 3 Right for Me? So we get down to the most important question, is the Surface Pro 3 right for me? To answer this, let me explain my computing patterns. My job requires that I travel often, working remotely from client offices. This means that I have to always carry my laptop, plus training material etc. I also need to be able to work from any location without readily accessible power. I need to give presentations to large groups as well as one on one. On a personal level, I need to be able to consume multimedia (mainly movies, YouTube, online tutorial videos and documentaries), as well as run programs like Visual Studio, AutoCAD and audio editing. I am heavily invested in the Microsoft ecosystem at work (Office365, SharePoint, OneDrive for Business), personal (OneDrive, Xbox Music, Mix Radio) and Windows Phone. Over the last 3 months I have been contemplating whether I should switch to a 13”/14” high end Ultrabook or stay with the Surface. So being a data geek, I put this spread sheet together that compares the SP3 and comparing its features and cost to the Top 7 2014 Ultrabooks (click on image to get download the PDF version). The weight of the SP3 is ideal (the largest benefit I had from switching from a 14” laptop to the SP1 was a much lighter workbag). I’ve found that content consumption that lasts longer than 10 minutes is more comfortable on a tablet rather than my smartphone, so all I need to do to watch a movie, is flip open the kickstand and start watching (this works very well on a plane). This means I don’t have a need to buy a smaller tablet. The benefit of the cloud enabled Windows 8 is that my apps, work documents and data is synced between all my Microsoft devices. I don’t have to carry external storage drives and transfer data back and forth. After looking at the improvements of the SP3 and comparing its features and cost to the Top 7 2014 Ultrabooks, I have come to the conclusion that the Surface Pro 3 is next my productivity device. Time will tell if the Surface Pro 3 is a success with consumers. If you have any questions about the Surface, feel free to tweet me @NairobiWP.